It has come to my attention that I haven’t posted a picture of my full garden since July 9th, and it’s not from lack of taking the pictures. While I was excited about the burst of garden glory back then, it pales in comparison of the garden at the height of its glory. 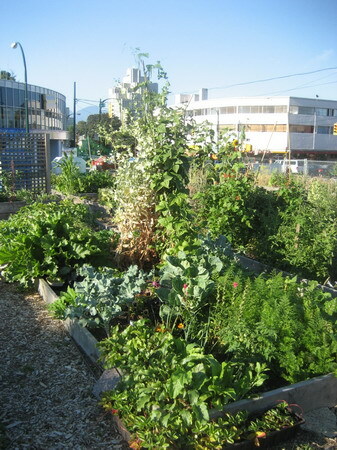 By mid-July the “tee pee” was completely covered in greenery in a combination of peas, snow peas and giant pole beans. By early August most of the brightly coloured snapdragons were finished blooming, the rhubarb was in full spread, and the broccoli was well on it’s way to growing a lovely head. The beet greens continued unabated and the carrots were still a bit too small for harvest. 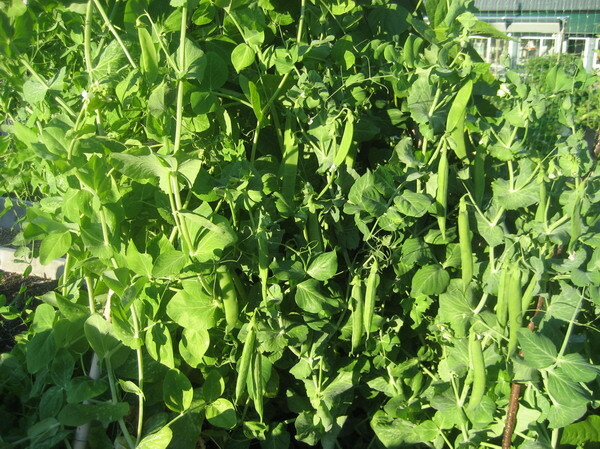 In the photo below you can see that the snow peas are on their last legs, turning brown and suffering from a powdery mildew. 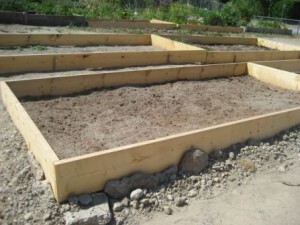 By last August, the peas were long gone, the snow peas had died and been removed, and only the pole beans continued to produce a few beans here and there. The broccoli has all been harvested and one row of carrots has been partially harvested which allows more room for the rainbow chard to flourish. The dwarf tomato plant in the foreground is heavily laden with fruit but none has ripened yet. 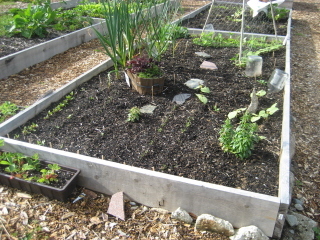 Brussels sprouts are on the rise, and most of the pole beans (behind the chard) have been removed. 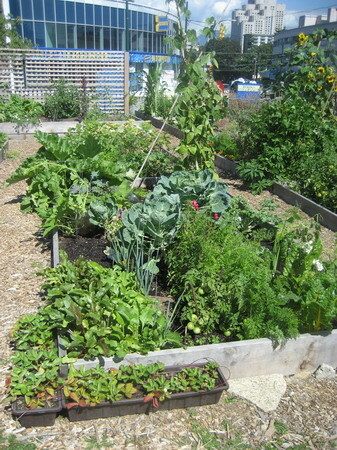 This entry was posted in 16 Oaks Community Garden, Urban Gardening and tagged 16 Oaks Community Garden, garden update on September 2, 2010 by local delicious. 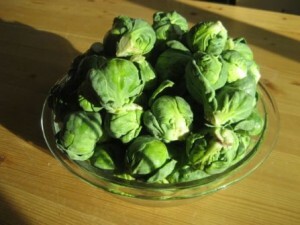 You either love or you hate brussel sprouts. I don’t think there is an in-between way to feel about them. I happen to love them, though until about 2 years ago I didn’t know how they grew. I never really thought about it, to be honest. I’d heard that you can wait until the first frost to harvest the sprouts, and that this makes them sweeter, but after I experienced some garden theft, I decided I better get them out while I could. I trimmed off the big leaves first and, after mucking about with a knife and accidentally slicing into a couple of them, I figured out that you can snap them off horizontally. I got quite a haul — a least a few meals worth — and tried them for the first time last night. 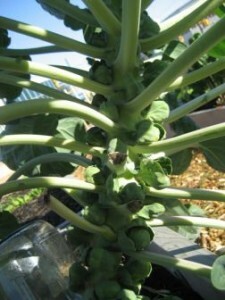 I may be a little biased, but they were the sweetest, most tender Brussel sprouts I’ve ever eaten. And that’s many years’ worth. 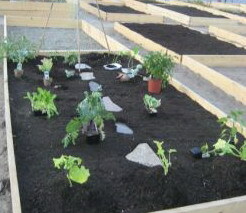 This entry was posted in 16 Oaks Community Garden, Bumbling Gardener, Urban Gardening and tagged 16 Oaks Community Garden, harvesting brussel sprouts on December 16, 2009 by local delicious. It’s a bit late in the season to be starting a garden, but since we just got our soil, such is life. 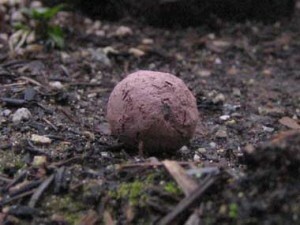 I figure it’s one giant experiment for this bumbling gardener anyway, so it’s all good. While waiting a few weeks for the soil to arrive, I went to a few nurseries, found the last dregs of potted veggies, and bought a little of everything I could find: broccoli, sad looking cauliflower, Brussels sprouts, some fruit-laden tomatoes, a few cabbages, a cucumber, zucchinis, and a couple of sweet peppers. While at the Kits Farmers Market I also found some kale (hurrah!) 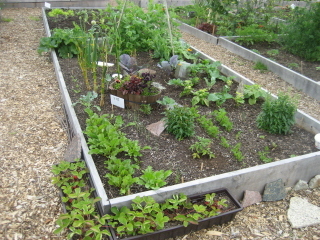 and sprouted lettuce to complete the mix. During the wait I also had the good fortune to find 3 very tall, perfect, bamboo poles someone left near the garbage bins outside my apartment. With the addition of some inexpensive netting, they proved to be the perfect solution for my sprouting peas. I also scavenged some granite counter/tile leftovers from a friend’s backyard. She had scavenged them from someone else for some kind of garden feature that was never quite realized. With my treasures and a warm summer evening to play in the dirt, my garden has finally come together! The snow pea “teepee” is a big hit, as are the granite stepping stones which will help ensure I can water and harvest plants in the middle of the garden, as well as from the edges. 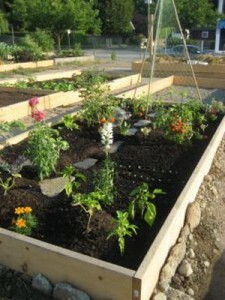 This entry was posted in 16 Oaks Community Garden, Urban Gardening and tagged 16 Oaks Community Garden, seedlings, Urban Gardening on July 14, 2009 by local delicious. 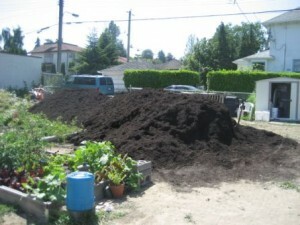 When the soil/compost arrived to fill the new boxes at my community garden, there was much rejoicing, and not just by me (okay, I might have been the loudest). 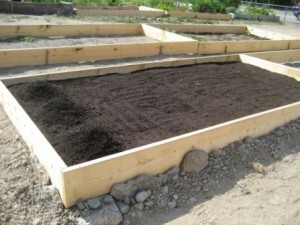 It was hot, sweaty hard work, but very exciting to finally be so close to putting plants and seeds in the soil. A huge thank you to the folks who organized and made it happen! 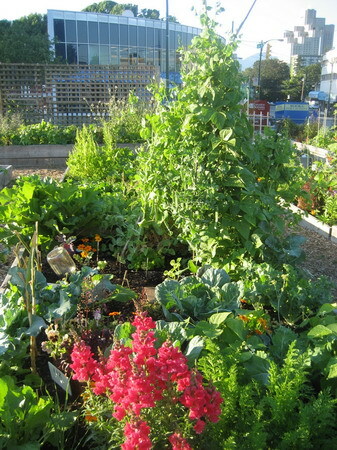 This entry was posted in 16 Oaks Community Garden, Urban Gardening and tagged 16 Oaks Community Garden, Urban Gardening on July 12, 2009 by local delicious. I think the coolest part of being part of a community garden is meeting other gardeners, learning from them (all tips welcome! ), and developing a sense of community around a shared passion. I love the idea of surreptitiously planting things in neglected and abandoned lots that aren’t being used for anything, even if it’s just flowers to brighten up the walk to work. Heavy Petal also has a virtual garden tour where you can upload pictures of your garden and take people on a “tour” of how yours is coming along. 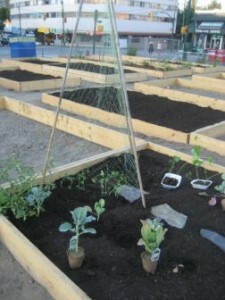 This entry was posted in Urban Gardening and tagged 16 Oaks Community Garden, gardening tips, guerilla gardening, HeavyPetal.ca on June 30, 2009 by local delicious.